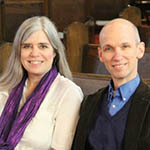 Unitarian Universalist worship styles vary by congregation, and even within congregations. Some congregations’ worship is contemporary and high tech. Some congregations’ worship is traditional and formal. Some features exuberant music, some includes long periods of silent reflection. Our congregation’s worship is a combination of traditional and contemporary. From time to time, worships incorporate holiday celebrations, multigenerational plays and pageants, longer musical performances, child dedications, and coming-of-age ceremonies. Between Labor Day (beginning of September) and Memorial Day (end of May) we have two worship services on Sunday mornings, at 9:30 a.m. and 11:15 a.m. We offer closed captioning at the 9:30 a.m. service, and the choir often sings at this service also. Our Children’s Religious Exploration program is offered during the 11:15 a.m. service, with the children beginning in the sanctuary and then leaving for their classes after the Story for All Ages. Nursery care for the very young is offered during both services. From Memorial Day to Labor Day (June through August) we have only one service at 10:30 a.m. with closed captioning and Children’s Religious Exploration at the same time.